I wish I had been eating late-night Taco Bell and guzzling six-packs of Mountain Dew. It would have explained why waking up felt impossible, why my brain was as hazy as Dorinda Medley’s after making it nice in the Berkshires, and why the button on my jeans could have passed for a belly button ring because it was lodged so tightly into my stomach. The reality? My issue wasn’t fast food or sugary drinks—it was my overly engineered diet. I didn’t understand how “sluggish,” “brain fog,” and “bloat” were part of my vernacular. Didn’t that happen when you eat unhealthy? I ate avocados! And kale! I prioritized low-glycemic fruits. My morning greens-based smoothie had coconut milk, collagen, maca, ashwagandha, and vegan protein powder in it. I didn’t drink coffee—instead I opted for brain boosting matcha spiked with some almond milk. Dairy, sugar, and gluten were reserved for going out to eat. My diet read like a Fitfluencer’s IG feed (except without all that #ad money). The only bad eating habit I could point to was cleaning out a jar of almond butter a week. Aggressive, sure, but unhealthy? Eye roll. I thought I was doing everything right. But when I took a closer look at my diet, wondering why I was still feeling like garbage, I realized that some of my “healthy” eating behaviors were anything but. Case in point? Work stress and late nights at the office, which led to 8 pm workouts, and then even later dinners, had put me in a cycle of having smoothies for dinner, or even worse, just a banana with almond butter, out of sheer tiredness. I tried to optimize my diet with powders and health-food fixes, but I wondered if that was just a cheap replacement for whole-foods sources of these nutrients I wasn’t always eating. I realized that in my 10 years of working in the wellness industry, my diet had gotten way restrictive. I was so busy following the latest trendy research or eating plan that I wasn’t finding what truly worked for me. I also was just straight-up not eating some foods that are generally considered to be healthy. 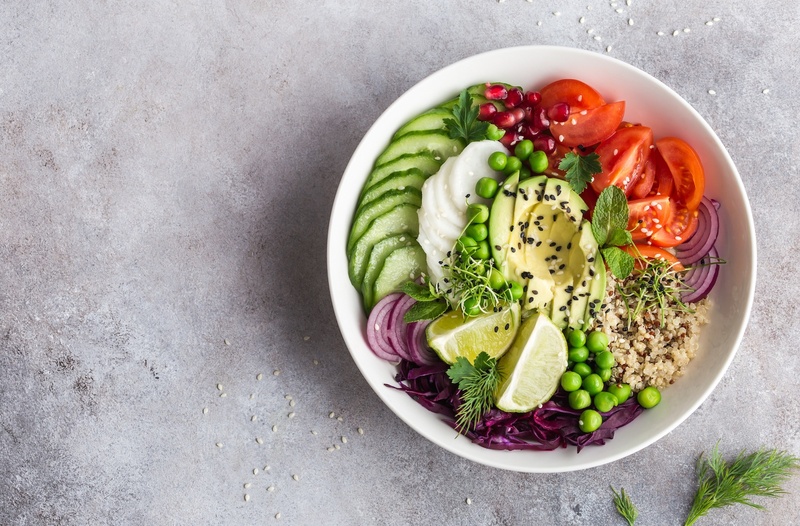 I had nixed a lot of nutrient-dense produce, for example, because books and studies I’d read over the years seemed to show that foods like tomatoes, corn, eggplant, peanuts, and potatoes could cause health issues like bloating and inflammation. Scary stuff, to be sure—but I wondered if my restriction wasn’t right for me, especially since I didn’t have any food allergies or intolerances. The other thing is that maaaaaybe I had a moderation problem. Drinking three to four matcha lattes a day probably wasn’t ideal for me (or my wallet), and my two avocados and quarter jar of almond butter a day meant my fat intake from these two things alone—even though it was the “good kind”—was almost two times higher than what is recommended by the Mayo Clinic. Which isn’t exactly the epitome of a balanced diet, you know? I decided something had to change. Not only was I uncomfortable in my own skin, I was about to be responsible for a Brooklyn-wide almond butter shortage. So for the next month, I decided to completely cut out processed foods from my diet. My issue, I realized, wasn’t so much that I ate a ton of unhealthy processed foods, but that I relied on “healthy” processed foods as a time-savings crutch. So by removing them, I hypothesized that it’d force me to get back to eating three full meals a day. The switch to eating whole, fresh fruits and vegetables was drastic—pretty much anything that came in a box, jar, or plastic bag was out, regardless of how healthy it appeared. But like Drake, I go 0 to 100 real quick so if it meant things like olive oil, brown rice pasta, and coconut milk would also have to go, so be it. Once packaged foods were off the table, I decided that any fruit, vegetable, or legume was completely OK to eat, even ones like tomatoes that I had been avoiding for years. So what exactly did no processed foods look like? On a typical day, I made a smoothie with dragon fruit, bananas, blueberries, and water for breakfast. Lunch usually involved a big (big) salad with Trader Joe’s cruciferous crunch mix, roasted butternut squash and broccoli, tomatoes, cucumber, parsley, and lemon juice for dressing. For dinner, I ate a huge bowl of steamed veggies (Brussels sprouts, broccoli, squash, mushrooms, carrots, whatever looked good to me that week) and lentils. (A far cry from my usual bananas plus jar of almond butter sitch.) Instead of matcha, I sipped on lemon water all day, and had homemade celery juice in the morning. And if I got hungry in between meals, I reached for two apples and a few dates for a snack instead of my usual cauliflower puffs or moringa-flavored something with turmeric dust. In an odd way, what started out as something seemingly restrictive ended up being the one thing I needed to help me get back to a more balanced way of eating. Given how, ahem, drastic this eating shift was, I was prepared to look and feel like a creature from The Walking Dead with withdrawal symptoms (headaches, feeling tired, and a bit ornery). But honestly, I felt…pretty fantastic. Over the course of the month my sleep improved, I woke up with energy, my brain felt sharper than it had in a long while, and bloating just wasn’t a thing. I was waking up before my alarm, I had energy to make food when I got home, no matter how late it was, and I was craving water instead of reaching for matcha. I didn’t miss the almond butter or protein powders at all. The only tricky part was going out to eat with friends because I didn’t want to completely bail on my no processed foods rule, so I’d just opt for the side vegetables or the vegan option. I also discovered that I was eating more food—and more types of food—on this seemingly-restrictive eating plan than I ever did in my regular diet. (Remember, I wasn’t eating tomatoes before this.) With this experiment, all of those “forbidden” foods were suddenly back on the table—and I loved it. Ultimately, my no processed foods challenge made me realize that in my 10 years of working in the wellness industry, my diet had gotten way restrictive. I was so busy following the latest trendy research or eating plan (or relying on powders and packaged snacks as crutches) that I wasn’t really finding what worked for me. I discovered that healthy eating truly doesn’t have to be so complicated. All I needed to do was to follow the most obvious, OG wellness advice: load up on fruits and vegetables, and drink water. Simple as that. It’s been a few months since my experiment, and I’ve since added some processed foods like matcha and olive oil back in to my routine (I am a human being, after all). But I’ve tossed the powders (protein, greens, collagen, etc.) in exchange for eating whatever fruits and vegetables I feel like. I’ve also cut back on avocados—the horror!—and am keeping my almond butter consumption to an appropriate level. Balance is the watchword, people. In an odd way, what started out as something seemingly restrictive ended up being the one thing I needed to help me get back to a more balanced way of eating. That said, sometimes late nights at the office mean my perfectly prepped parsnip and leek soup sounds about appealing as drinking a glass of warm sauerkraut juice. So while I may not shotgun a can of Mountain Dew, I’m totally going to take myself out for a burger. Other confusing food topics: How healthy are potatoes, anyways? And how do you interpret all of those labels on the back of packaged food?